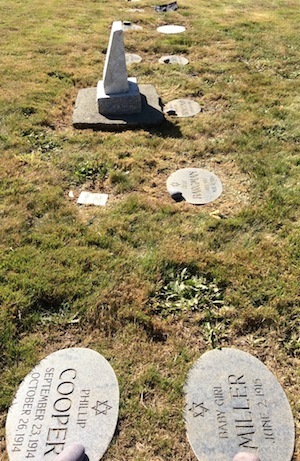 “When we were restoring the Jewish cemetery at Mountain View, we spent two years going through City of Vancouver material trying to determine if the city actually had something in writing to prove the legitimacy of this Jewish section since 1892,” Shirley Barnett, who led the Jewish cemetery restoration project, told the Jewish Independent in an email. The committee couldn’t find anything in the city records. While this lack of documented history lengthened the restoration agreement process significantly, it did not halt it. 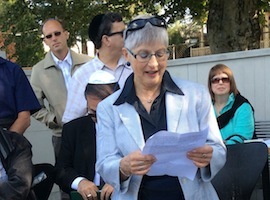 Barnett, as chair, opened the first meeting of the restoration advisory committee on Feb. 13, 2013, and the Jewish cemetery at Mountain View was officially rededicated on May 3, 2015. However, if the committee were to have started its work today, the information it sought would have been found, and the process would have moved much more quickly. On Dec. 7, 2018, the Jewish Independent met with Barnett, Sullivan, Sutherland, Lynn Zanatta (Global Civic Policy Society program manager) and Glen Hodges (Mountain View Cemetery manager) at Mountain View. In documents she brought to that meeting, Sutherland explains that Oppenheimer “declined to serve as mayor again at the end of 1891, citing poor health as his reason for retiring. 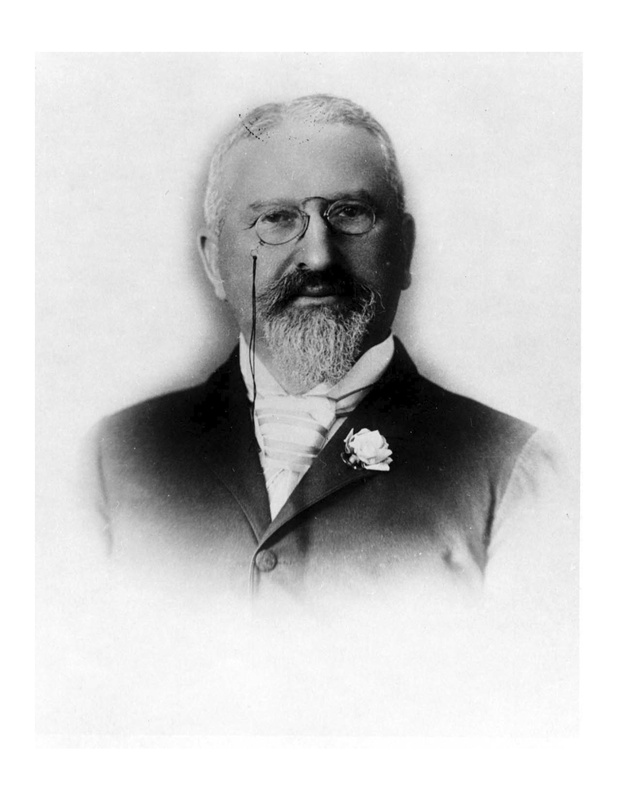 Fred Cope was elected mayor in 1892 and served till the end of 1893.” So it was Cope who was mayor when the Jewish cemetery was established; Oppenheimer was Vancouver’s second mayor (1888-1891) and Malcolm Maclean its first (1886-1887). The first interment at Mountain View Cemetery was Caradoc Evans, who died at nine months, 24 days, on Feb. 26, 1887. The first Jew interred in the cemetery is thought to be Simon Hirschberg, who “died of his own hand” on Jan. 29, 1887, and was, according the plaque erected by the cemetery in 2011 (the cemetery’s 125th year), “intended to be the first interment,” however, “rain, a broken carriage wheel on a bad road and his large size all contributed to him being buried just outside the cemetery property,” where he was “long thought to have been left near the intersection of 33rd and Fraser” until his body was moved into a grave on cemetery property. Oddly enough, the first Jew to be buried in the Jewish section was Otto Bond (Dec. 19, 1892), who also took his own life. This page from a Mountain View Cemetery ledger shows the entry for Otto Bond, the first Jew to be buried in the cemetery’s Jewish section. So far, since its inception in 2012, Transcribimus has seen more than 300 transcripts produced by almost 40 volunteers, although a handful of them are responsible for the lion’s share to date. Many people have donated their time, technical advice and, of course, funds to the project. 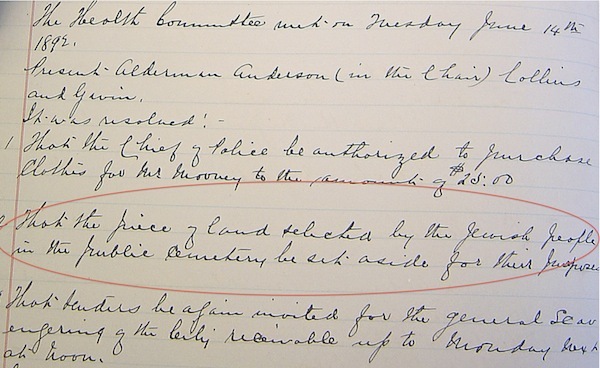 Barnett sponsored the transcribing of the city council minutes for 1891, and fellow Jewish community member Arnold Silber sponsored the transcription of the 1890 minutes. A few other years have also been sponsored, including 1888, by the Oppenheimer Group. About nine years’ worth of minutes have been transcribed (1886-1893 and 1900), leaving much more work to be done, as the city kept handwritten minutes until mid-1911. After that, minutes were typewritten and these documents can be scanned and read with OCR (optical character recognition), said Sutherland. Sutherland hadn’t come across Goldberg’s letter, that of Davies or any response to Davies. It’s likely that these letters have been lost or destroyed, but they might turn up in another file, she said. The old joke comes to mind of the Jewish man who, when stranded on a deserted island by himself, builds two synagogues – the one he’ll attend and the one he won’t set foot in. Community cohesiveness is a heady task; always has been, and definitely not just for the Jewish community. As more council minutes, letters, photographs and other documents are found, transcribed and shared, the holes in our understanding of the past and how it has formed the present will be filled. To support or participate in Transcribimus or other Global Civic Society projects, visit globalcivic.org. The Schara Tzedeck Cemetery Board has appointed its board of directors for 2018, and is planning more facility upgrades for the coming year. The cemetery board is co-chaired by Jack Kowarsky and Arnold Silber. Other members of the board are Shirley Barnett, Harvey Dales, Joshua Hauser, Dr. Mark Schonfeld, Gary Segal, Herb Silber, Isidor Wolfe, Rabbi Yosef Wosk and Barrie Yackness. Honourary board members are Charles Diamond and Joseph Segal. Howard Kallner, president of Congregation Schara Tzedeck, also serves on the board in an ex-officio capacity. The board has made significant improvements to the chapel in New Westminster over the past two years. Constructed in the early 1990s to house the chevra kadisha, as well as to provide a chapel at the New Westminster cemetery, this building was in need of repairs and upgrades. This $600,000 project was completed last year with the generous contributions of many in our community. This year, the board is planning to move ahead with another key project. The community cemetery located in Surrey has about 2,500 plots, and began having burials in 2008. To date, there is little infrastructure at that location, only a small handwashing station and a portable building. Plans are being developed for the construction of a chapel building that will allow the cemetery to better serve those who choose this location. The chapel will seat between 40 and 50 people, provide a private space for families to gather prior to a funeral service and have two accessible washrooms. It will also provide facilities for cemetery board groundskeepers to store equipment. Part of this project will include improvements to the fencing of the cemetery, as well as improving the gardening and landscaping to make the cemetery a more welcoming place. The cemetery board provides its services to the entire community. Members and non-members of Congregation Schara Tzedeck may purchase plots in any of the cemeteries. Orthodox, Conservative, Reform, and those involved with congregations associated with other Jewish movements, all use the chevra kadisha, which is comprised of diverse members of the greater Jewish community. Funeral directors Rev. Joseph Marciano and Howard Jampolsky (who also serves as the executive director) are available anytime to answer any questions, and to provide more information about the availability of burial plots in all three of the community’s cemeteries – New Westminster, Surrey and the Jewish section of Mountain View. They are also available to provide information about pre-planning funerals in order to relieve family members of this task during the difficult time when a loved one passes away. They can be reached at 604-733-2277. To learn more about the board or to contribute to the current Surrey Chapel Project, call Jampolsky at 604-733-2277 ext. 204, or email [email protected]. On Sept. 11, a small crowd gathered at the Jewish section of Mountain View Cemetery for the unveiling of 87 headstones for babies and children who had passed away between 1893 and 1996. Shirley Barnett, chair of the Jewish cemetery restoration project, which began in 2012, welcomed attendees. She acknowledged several of the people who greatly contributed to the project, and noted there is still a need for financial support. Rabbi Andrew Rosenblatt of Congregation Schara Tzedeck said a few words about how the loss of children is treated in the Tanach, while Rev. Joseph Marciano chanted the prayers for the unveilings. Before the service, however, Barnett paid tribute to Helen Aqua, who donated the funds for all of the 87 headstones unveiled that day. “I am but a small piece of this project, and most proud to have been part of this restoration,” said Aqua. The project also received $27,000 toward the restoration from the federal government’s Canada Western Economic Diversification Infrastructure Canada 150 Grant. Representing the Government of Canada, Dan Ruimy, member of Parliament for Pitt Meadows-Maple Ridge (Liberal), spoke. People were invited to walk through the cemetery, and Daniella Givon led a tour, using a guidebook created by the Jewish Museum and Archives of British Columbia. “Sometimes it takes awhile,” said Shirley Barnett, chair of the Mountain View Jewish Cemetery Restoration Project. But generally not 124 years! In 1891, Vancouver mayor David Oppenheimer, member of a prominent pioneer Jewish family, was approached by the growing Vancouver Jewish community to reserve a section within the city-owned Mountain View Cemetery to be consecrated and used exclusively for Jewish burials. At the time, when a Jewish person died, they were sent to Victoria, where the community had already established a cemetery. Oppenheimer was born in Germany in 1834, one of 10 children. He emigrated to New Orleans in 1848 with his sister and four of his brothers. Becoming a bookkeeper, and later a trader in the California gold rush, the Oppenheimers relocated to Sacramento, where David invested in real estate, and married his first wife Sara in 1857. After the gold rush, the Oppenheimer brothers moved to Victoria, establishing stores throughout British Columbia, catering to prospectors and settlers. Also building a real estate portfolio, they expanded their interests in Vancouver. Although Malcolm MacLean was the first mayor of Vancouver, it was Oppenheimer who is remembered as the “Father of Vancouver.” In his four terms as mayor, from 1888-1891, he implemented many basic civic services: fire department, streetcars, water supply, utilities, schools and parks. He was also a philanthropist, a founding member of the YMCA, Vancouver Board of Trade, Vancouver Club and many charities. Establishing a Jewish cemetery at Mountain View in 1892 was one of his many accomplishments. Without minutes of meetings or other documentation, however, the only evidence of this was a number of articles published over the years, and the records of burials. In 2015, 124 years later, the City of Vancouver recognized the historical establishment of the Jewish section at Mountain View and, based on this, an oversight agreement with Schara Tzedeck Cemetery board was signed. The agreement confirms that the cemetery board has the right to oversee all interment and funeral services within that Jewish section. Although Oppenheimer himself was buried in New York, many of his colleagues were laid to rest at Mountain View. Over the past two years, a restoration of this old cemetery been undertaken. Now complete, the rededication will take place on Sunday, May 3, at 1:15 p.m.